I am very happy to see this for 1.8.9. 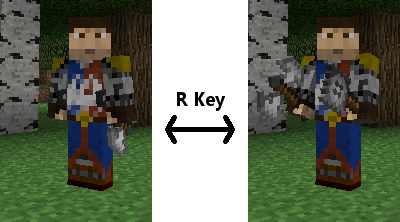 I have noticed a bug however - you cannot use Tinker's Construct weapons - this worked fine in the 1.7.10 version. Can you fix this please? have a conflict with Inventory Crafting Grid, game crash in loading world. SO BAD, CAN'T LOAD WORLDS BECAUSE OF THIS! The Battlegear 2 HUD is not showing up. I have a feeling this is due to dual hotbar. But is it necessary to have the HUD to play this mod? Or is that just an aesthetic thing? I'm having the same issue. If you are a Witchery Vampire, your ability to have the BattleGear Hotbar goes away. I even tried moving it around the screen but still doesn't work. How does one even put arrows into a quiver? My frame rate drop down to 3 while looking on the ground or wall. Except looking up the sky the FPS is fine. 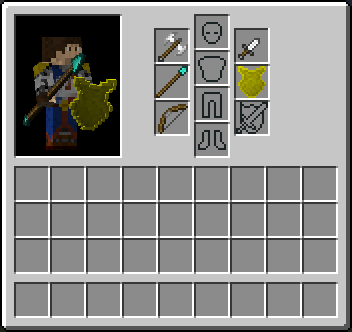 Since I can't figure it out from the github, can you explain what all the enchants are and what they do on the 1.7.10 version? I'm using this mod on 1.7.10 vrsion, and dual wield doesn't work for me. I can equip two weapons, but I can't hit with an off hand. I can't enter the server.